- Fixed something that could break fortresses (related to people being in the zone before fort starts). - Removed bag and token generation from forts for now as we observe. - Another attempt at stopping fort lord from going downstairs. - Fixed the missing portals to the maw. - Fixed an issue where a fortress would bug out if defenders defended it and attackers pushed back to the fort. - Stage 2 fortress will show BOs on map. 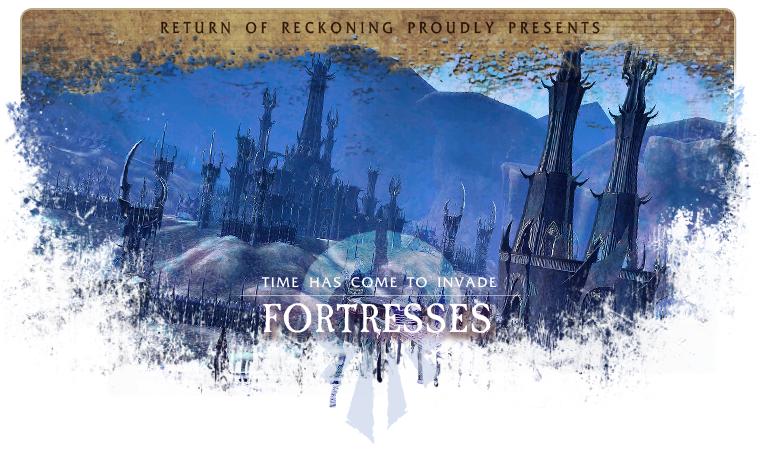 - Reservations for fortress is now in! Once the previous zone locks the top 24 contributors from each side will have reserved spots for fortress for 5 minutes (those players will get notified). - Fixed an issue where fortress walls would not spawn/despawn properly, and its now done once a fort starts / close instead of what we did previously. - Fortress portals are now slightly elevated to be more visible. - Pounce like abilities should not be usable anymore while caged up in a fortress. - Getting pulled out of a cage in a fortress should no longer be possible. - Fort lords should no longer go downstairs, last attempt was borked. - Fixed the portal to Reikwald. - Teleporting players out of the Fortress zone once the fort starts as to not have people trying to cheese it by staying there for hours on end. - Fort lords now have proper messages when doing abilities and not the debug messages. - It should no longer be possible to fight the fort lord below his room. - Added clearer messages to players whats happening in fortresses. - Increased the cap on resource box gain slightly. - Fixed issues where war report had a 49k day wait. - Fix underflow on repeatable quests. - Fort lords now has the same "die X" message as keep lords. - Changed a variable to fort lords damage output. - Fixed a nullref that prevented the Fort from completing properly. - Battlefield Crates have been capped, this was causing Keeps to rank up very quickly. We will continue to monitor the gains and adjust as needed. - WAR Report will no longer be available for Fort zones. This was causing the population limiter for the zone to be ignored and was not intentional. - People in cages in forts should not be able to be attacked or attack someone else. - People in cages are not supposed to release themselves. - Number of bags from forts misbehaved, should be better now. - Remove rams from forts when they are done. - Removed portals that were used to bypass the limitations of forts. Fortresses are huge keeps that guard the entrances to Capital Cities. Larger than even the largest tier 4 keeps, Fortresses have huge outer walls, and command a view of the countryside around them, ready to defend against all comers. The fields of the Empire burn as the Chaos host closes, and the smoke of Reikland's fired fields cannot help but be blown south with the Reik river's natural fog. The billowing haze culminates in the Reikwald, and the fortress there stands like a massive sentinel amongst the mists that engulf it. Atop the fortress stands Rhinehardt Ortmann, a warrior priest as stalwart as the stronghold he commands. Charged with Altdorf's last line of defense by the Grand Theogonist himself, Ortmann has promised to give aid to all who have fled south from the marauding armry of Chaos. While Ortmann stands the safety of Reikwald's fortress, and the capital of Altdorf beyond, remains accessible to fleeing citizens of the Empire. Where most fortresses are built to repel invaders with their very image, the stronghold of the Maw is meant to invite invading armies deep into the Chaos Wastes. Many armies have wandered into the deep Wastes in search of the fortress of the Maw, traveling into progressively darker and more bizarre terrain. Most armies are caught unawares by the unfettered and sudden appearance of the fortress, but one look at the enormous walls that frame the stronghold and surprise soon fades to despair. However, the commanders of the Maw will not impede an newly arrived as it prepares to lay siege, nor will do much more than protect its walls from incursion. For the commanders of the fortress in the Maw know that waiting is the secret to fighting this deep in the Wastes. One need only wait and soon his enemies will be fighting each other, shouting at shadows, or wandering unthinkingly through the sand and snow, the insanity of the Maw having finally consumed them. The Dwarfs might guild their drinking halls and celebrate their hordes, but when it comes to battle the Dwarfs know that only keen edges and bitter stances matter. The fortress at Stonewatch is a testament to the dour simplicity of the Dwarf defense. With walls that merge with the stone of the mountain, and foundations that go as deep as the roots of the world, Dwarf fortifications have no equal. Hidden masterfully within the crannies and niches of the stone are entire batteries of cannons already aimed and ready to fire. To assault the fortress of Stonewatch is to assault the side of a mountain, and all who have tried have failed as the great carved eyes of Karaz-a-Karak's entrance look on. The fortress of Butcher's Pass is a sprawling settlement as large as any castle town. Originally the greenskins there simply occupied the remains of the Dwarf keep there, but eventually they grew so numerous that they began adding onto the ruins wherever they could. More and more huts and towers sprung up with the ruins, and the central keep grew larger and larger, rising from fort to fortress in a matter of week. Now nearly three keeps built atop one another, the central bastion of Butcher's Pass is both the home of its boss, Grumtusk Da Ravager, as well as a mammoth fighting pit. At such rambling dimensions, the fortifications of Butcher's Pass should prove impenetrable attackers, for even if they were to breach the walls, few would have any idea where to go or what to attack next. The fortress of the Shining Way was once a center of study and peace sitting atop a grand hill overlooking the Straights of Lothern. The university took pride in teaching the noble heirs of Eataine the histories of Ulthuan's politics and houses. However, as soon as Malekith's armies invaded and the fields of Eataine began to burn, the school was quickly converted into a stronghold suited to protecting the capital of Lothern. Now, defended by legions of mages and soldiers, and commanding a view of Eataine for leagues, there are few threats that such bastion of strength and knowledge could not withstand. Where Malekith's Fist landed the ground cracked and burned for leagues, heralding the coming of the Witch King. From the deep within the colossal Black Ark the materials to construct a huge fortress were gathered. Dark ores and blood-forged steels, ensorcelled irons and crystals of concentrated Aethyr, all were combined to create a foundation that would blight the land of Caledor to its very core. Even as his armies marched east, Malekith had his trusted servants labor to raise the fortress higher, and soon it filled the entire valley. Now Caledor's western coast is sealed off behind sinister walls and blackened earth. For a High Elf to even tread near the despoiled land is to risk his lunch, and every army that marches west to assault Malekith's Black Ark and must contend with the unnatural malevolence locked within the land. - Fortresses are now live! They are subject to change; There may be balance changes or bug fixes. Defenders can never be more then 80% of the attackers force. The maximum amount of attackers is 96 players (4 full Warbands, and this hardcap may be changed or removed in the future). You will need to be Rank 40 and Renown Rank 40 to enter. Everyone will have 15 minutes while the the outer doors are destroyed. This will allow everyone to gather forces to attack or defend the assault. Five flags will be located in areas surrounding the Fortress. Every 1 minute interval the following will occur: For each flag the defenders hold, the lord will become stronger. For each flag the attackers hold, the defenders will be showered with an artillery barrage, and if attackers hold all 5 flags the inner door will fall much faster. This is where you will fight the Lord in order to finally defeat your enemies Fortress. Each Lord has unique ability combinations and will use different mechanics in order to defend their keep. Once a player of a defending realm releases their corpse they will be placed in a cage at the attackers staging area and will have to await rescue from someone from their realm. The attacking realm will win if the Lord is defeated. If the attacking realm is unable to successfully win within 1 hour of the assault on the lord starting, the defending team will prevail and be victorious. - If you talk to a profession trainer now when you have a profession of that type it will now instead show you a dialogbox asking if you want to unlearn your current profession to make room for the new one. - Attempting to form an alliance will now properly show a dialog window for the receiver with a confirmation if they want to form the alliance or not. - When keep ranks up doors should now also be healed up to the new value (as of ranking doors of last week). - Siege weapons should no longer be able to take any healing. - Overlord and Imperator sets have been retired and can no longer be acquired. Existing items will remain in your inventory. These vendors will have new rewards to choose from. This allows the Scenario Manager to better attempt to construct balanced groups out of the Tank/DPS/Heal archetypes from available players. This does take into account players specced as DPS while playing a Tank or Healer class, which may affect pure DPS classes as they are sharing their role with more classes. Essentially this means that pure healers and pure tanks will have the fastest pops, where anyone attempting to queue as DPS will typically have more players in the queue to choose from. If balance is not attained, but there are enough (6 or more) players to start a scenario, it will do so anyway, which means during less populated queues, imbalanced groups can still created, but it should be much less common overall. The backfill mechanic should also be more apparent. The Scenario Manager will not attempt to backfill an overpopulated team, instead it will attempt to backfill the underpopulated side before looking to fully fill the scenario. This happens every 30s to attempt to meet balance requirements and bring in needed classes to the scenario. We will continue to monitor the system and make any changes needed, but largely it is working as intended. - The Missing Maiden questline has been discontinued. - Fixed another issue which could cause Repeatable quests with a delay not to expire correctly. - Public Quests with a Protect stage should be fixed. If imperator\ovelord vendors gone, any chance we may spend our seals? Last edited by mikke on Sat Feb 16, 2019 11:29 am, edited 3 times in total. Hey, this is nice, I'm excited to stomp around in forts! When the fortresses come into play will other rvr zones stay open so that players who are not r40 /rr40 can continue with the campaign? Great patch! Great hype! Amazing work. Great! But if imperator\ovelord vendors gone how can we spend ous seals?